And, well... it got me to thinkin'. Scripture is neat that way: often even a sidelong and casual glance at it will burns a reflection into the mind. Is not my word like fire? (Jer. 23:29). 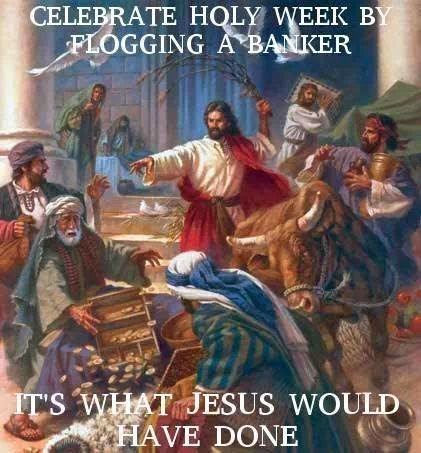 You see, it is Holy Week, and someone thought this was an appropriate post for the occasion. And that is because, in all of the synoptic accounts of the events of Christ's final entry into Jerusalem and His passion and death, this event - the "Cleansing of the Temple" - is placed in the very days leading up to the climax of the story. But what is interesting is that, in John, the incident is placed quite early - in chapter two, in fact. Well, of course, details in the narratives, and particularly timing - and especially in John, who includes weighted little descriptors like "and it was night" - can be theologically significant. Anyhow, though, we won't digress into debates of the synoptic problem and all that. After all, it is as likely as not - in the present case - that the placement of the synoptic accounts of this particular event corresponds to the historical fact: indeed, the ruckus caused in this scene not only provide motive for those who would petition Christ's death, but also a rationale for the Roman government to quell a known rabble-rouser. What's interesting to me, though, is that this scene comes in the narrative of this week - and what it might mean for each of us. Of course, it's always worthwhile in these matters to consult The Fathers. It should be known that in obedience to the Law, in the Temple of the Lord venerated throughout the whole world, and resorted to by Jews out of every quarter, innumerable victims were sacrificed, especially on festival days, bulls, rams, goats; the poor offering young pigeons and turtle-doves, that they might not omit all sacrifice. But it would happen that those who came from a distance would have no victim. The Priests therefore contrived a plan for making a gain out of the people, selling to such as had no victim the animals which they had need of for sacrifice, and themselves receiving them back again as soon as sold. But this fraudulent practice was often defeated by the poverty of the visitors, who lacking means had neither victims, nor whence to purchase them. They therefore appointed bankers who might lend to them under a bond. Now, Jerome's interpretation of this passage, as with most Patristic commentators, seems basically to be that it contains a moral for priests and bishops and others who minister in God's sanctuary. But, if I may, I find something fascinating in the background Saint Jerome chooses to give here - how potentially packed with meaning it is! Think about it: people too poor to provide a victim to satisfy... and laid upon them, by those supposed to help them gain atonement, a kind of double-debt on top of the first debt of the Law. This is all of us: for humanity, on its own, is so impoverished, and also so doubly-in-debt: we need both a true Victim and a true Priesthood. And in the events of the same week in the Gospel, Christ presents Himself as both, and initiates in the same Last Supper the two sacraments that shall re-present Him as Victim and Priest to all the baptized until the end of time: the Eucharist and Holy Orders. Mystically; The Temple of God is the Church of Christ, wherein are many, who live not, as they ought, spiritually, but after the flesh; and that house of prayer which is built of living stones they make by their actions to be a den of thieves. Yes, other reflections on this wonderful scene have been offered, and will continue to be. Of course, it has also to do with issues of avarice and greed, and the relative blessedness of the poor - after all, immediately after we see iniquity chased from the Temple, we see the lame and the crippled invited in to be healed. But I offer that we shouldn't press any social justice reading of this too far: after all, of all the Gospel accounts, the tersest and in some ways least interested comes from Luke, who is usually identified as the Evangelist most concerned with the plight of the poor. Instead, I offer that the central motif here is one of MAKING ROOM: making a space ready for a new thing to be ushered in. Therefore, it is somewhat incidental to us whether this historical event happened in that first historical Holy Week or earlier in Christ's ministry - (or, as Augustine and others suggest, it happened twice). For us, in any case, there is a great spiritual merit to making it part of our Holy Week now. In order to "make room," as it were, for His Victimhood, His Priesthood, and His Rites of Atonement, Christ first had to clear out what only foreshadowed these, and imperfectly. Furthermore, He made it clear clear that the New Covenant demanded a break from all worldly thought: no hedging bets and conniving would have any place. Christ's rebuke to Peter - "You are thinking as man does, but not as God" - comes back to us here this same aspect of meaning as Christ's demonstration in the Temple. This was a merciful act, and an act of love: these things had to be cleared out, for they were passing away: the animal sacrifices and the dealings and the calculations were all to fade away under the shadow of The Cross. That Cross was the one and only payment that could be made, and we must bind ourselves over to it and to no other debt. Holy Week provides us a last and urgent opportunity to "make room," even if all of our Lent has been squandered. It gives us a chance to clear out the old ways from our life, to abandon our compromises and our bets, and to cancel all our debts to falsehood. We are the Temple of God. And we might find ourselves sometimes very much a den of thieves. But the True Victim and the True Priest, He Whose Temple it is... well, this is what He does. He rebuilds and restores the Temple. He cleansed the Temple once (or twice) upon a time. He restored the Temple (of His body) after three days following its destruction. And He rebuilds us, however broken from sin we may be, each and every time we fall - indeed, each and every day, with His Grace. We just need to make room for Him to do what He does.